The evidence piles up that the private sector auditors of banks have manifestly failed in their duties. 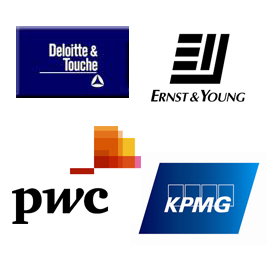 All the major banks received unqualified audit opinions from Deloitte & Touche, PricewaterhouseCoopers, KPMG, and Ernst & Young. Private sector auditors have a history of silence and are immersed in too many conflicts of interest. The evidence is their silence at Barings and Bank of Credit and Commerce International (BCCI), as well as at other debacles. Accounting standards for banks are set by the International Accounting Standards Board, but astonishingly this is a private limited company in London funded by the Big 4 accounting firms who audit the banks and major corporations – a nice cushy cartel whereby the accountancy companies control by their funding the body that is supposed objectively to set their standards. The rules have enabled banks to publish opaque annual accounts, and vast amounts of assets and liabilities have not been shown on their balance sheets. Accounting firms have shown no concern for serving the public or the national interest. As a result many toxic assets have continued to be shown on bank balance sheets as good assets. Despite the higher risks and falling credit-worthiness they have been able to inflate their profits with spurious adjustments such as debt valuation adjustments. That means that markets, investors, savers and regulators have been misled, with serious consequences for the economy. Clearly urgent reform is needed to ensure that accounting standards for banks are set by a body independent of the financial sector and the accounting industry. The rules need to be set by the regulator and approved by the Commons Treasury Committee. The audits of all banks should be carried out on a real-time basis either directly by the regulator or by a public agency specifically created for that purpose. This would enhance the regulator’s knowledge base and capacity for timely interventions, since in the era of instant movement of money ex-post audits are of little use. Banks will of course resist this, and have proved very adept at lobbying to resist legislation. Much of their lobbying power remains hidden from public scrutiny. All banks should be required therefore to publish the names of the lobbyists used, the public officials lobbied, the precise details of the lobbying pursued, and the amounts spent on the lobbying. When are the banks going to be reformed? Don’t all this lot advise many of the Labour shadow cabinet?